Milly, a 2 year old Labrador cross, was brought into our surgery because she had been vomiting intermittently for two days and had stopped eating. Within the vomit were small amount of a rubber backed coconut mat she had partly eaten two days previously. Fearing that more may remain inside her we advised that x-rays be taken of Milly’s abdomen. Initially x-rays were unrevealing. As some foreign bodies do not show up on x-rays we then gave Milly a barium meal. The barium, which coats the bowels and shows up clearly on x-rays, should move progressively through the gastrointestinal tract indicating that the bowel lumen is patent. On viewing Milly’s barium x-rays a large amount of radio-opaque material could clearly be seen in the stomach however there was no movement on into the intestines. It was agreed that surgery was needed. On exploratory laparotomy a large amount of matting was found in and removed from Milly’s stomach and duodenum. Milly recovered well from surgery and was hospitalised until she was eating and defecating normally. We are pleased to report that Milly is doing really well and is back to her happy doggy self. Feline leukaemia virus (FeLV) is an infectious agent most commonly associated with the occurrence of tumours and anaemia in cats, but it can also cause disease by suppressing your cat’s immune system. 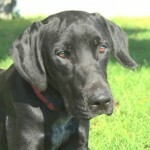 This will potentially leave your pet susceptible to a variety of other serious health issues. This is similar to the illness seen in humans with the AIDS virus and in cats with Feline Immunodeficiency Virus. The good news is that the FeLV virus cannot survive for long in the environment, so spread of infection between cats is reliant on prolonged close contact. Therefore, infection may be common in environments where there are a large number of cats. It is estimated that currently 1-2% of cats in this country are infected with FeLV. In multi-cat households where FeLV is endemic, up to 30% of the cats may be infected. Young cats and particularly kittens, are especially vulnerable to becoming infected. As cats get older their susceptibility to infection will decline. 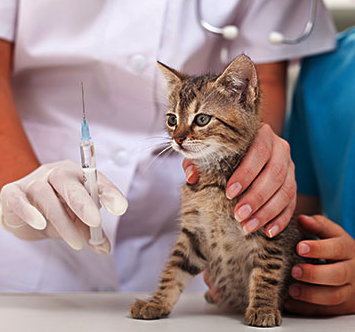 Nevertheless, vaccination of older cats is recommended if they are considered ‘at risk’. The virus is spread mainly via the saliva from a persistently infected cat exchanged, for example, by mutual grooming or sharing of food bowls. In addition, the infection can also be caused by biting or contact with urine and faeces containing the virus. The virus can also pass from a queen to her kittens either in the womb or after the kittens are born, via infected milk. The majority of cats become infected with the virus entering the body via the mouth or nose. The virus multiplies at these sites before spreading in the bloodstream to the rest of the body and, in particular, to the bone marrow. Not all cats exposed to the virus become persistently infected. If the cat is able to eliminate the virus, this will occur during the initial stages (4 – 12 weeks) of infection. Once significant infection of the bone marrow is present, the cat remains infected for the rest of its life. Signs of infection can take months or years to develop and so infected cats can appear to be totally normal and healthy for quite some time. The first signs of infection may be vague and non-specific because of the huge variety of problems that can occur with FeLV infection. The cat may appear to be slow to recover from minor infections, may be off colour and have a poor appetite over a period of time or may develop chronic or recurring problems such as diarrhoea. If tumours develop, the signs seen will depend on their site. Anaemia may result in pale gums and listlessness. No treatment will eliminate FeLV infection. The aim is therefore to maintain quality of life and manage the symptoms and effects.